St. Oswald's CE Primary SchoolLanguagesSchultüten 2017! On Wednesday 4th September the Year 5 and 6 children presented the Schultüten they had spent two weeks making to their buddies in Reception. We made a special occasion of this by learning a new German song called “Herzlich Willkommen” and singing it to the reception children. This song was recommended to us by our German partner school in Berlin, who told us that it would be the perfect song to welcome new children to our school. 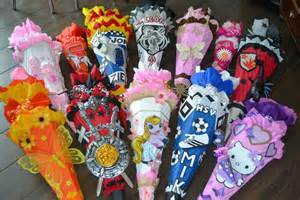 In Germany children receive Schultüten (cardboard cones made and decorated by their parents and filled with sweets and stationery) on their very first day at school. Well done to all the Year 5 and 6 children for singing so beautifully and for making the Schultüten so special. How wonderful it was to hear the Reception children saying “Danke schön” (thank you) when they each received their Schultüte.